Chrichton's World: Review No Tears For The Dead a.k.a. U-neun nam-ja: Ignore the tears and revel in the splendid action and you will be fine! Review No Tears For The Dead a.k.a. U-neun nam-ja: Ignore the tears and revel in the splendid action and you will be fine! Another action packed film from director of The Man From Nowhere. That alone will be the reason for many to watch it despite it's many flaws. So don't let me beat around the bush and dive into these flaws. A lot of time is spend on the main character Gon and his agony or guilt he suffers from killing a little girl by accident when he is on a job to kill someone. Now this is quite understandable and does make for an interesting premise if there was any real attempt to deal with it maturely. This never happens. In fact the ending that is drawn out to tedium is a slap in the face of the viewer who has spend his or her valuable time investing into this character. The nerve of the director to not even attempt to go there where the plot demands it. Like he was aware that it would be hard to materialize. It feels like the director took the easy way out and probably had hoped that as long as if he would get close to the real drama he would be forgiven for tricking us. Very unlikely. If someone truly is on the path of redemption he or she should should own up of what was done wrong and confront the person he or she has wronged. Here Gon is helping out the mother of the little girl without ever letting know why he is doing that. Why would someone go to all this trouble and then not talk to this person properly? It simply does not make any sense and is a very lazy way of making something appear meaningful while it's not. But why do I see this as a flaw? Am I not the one who keeps saying that plots in action based films don't matter much? I do think that in most the plot should be functional but whenever there is a chance to tell more then I applaud that. Only then you do have to make it worth your wile. And this is where No Tears For The Dead lets you down big time. All the time spend on Gon supposedly dealing with the guilt feels wasted. Not much is told that actually matters to the plot or characterization. It is mostly filler. Which is very troubling if the director for some reason doesn't want his film to end. Here the film would have been more effective had it been kept short and to the point. At many points in the film I lost my interest and did not care that much about any of the characters including the mother who has got to be the most unfortunate and tragic being considering what she has gone through. (There are some solid moments involving the mother that you can relate to. However these moments become obsolete because of the director's inability to confront his characters with real truth). Luckily though after an hour the hard hitting action kicks in and from that point on you are in for a treat. The action is top notch. It's exciting and very well choreographed. For the most part that is since the drawn out finale almost ruins all the fun that is to be had with the splendid action that is in it. It too often gets broken up by supposedly dramatic interactions that were completely lost on me. The one dramatic scene I was hoping for never comes and the plot had lost any meaning or point it wanted to make. All this time this film has been building up to this moment and then it just dissolves. 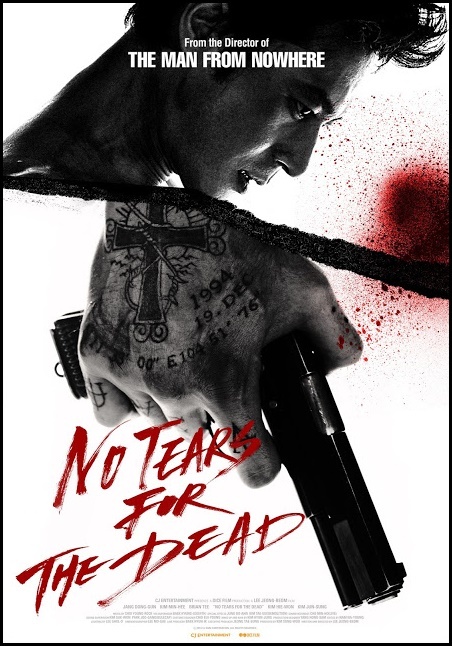 No Tears For The Dead is a good example why you should not be pretentious if you can't back it up properly. My advice. Ignore the drama in this plot as much as you can and watch this solely for the action. It will save you a lot of disappointment and anger.